Topman offers up-to-the-minute affordable fashion. Famous for its cult designers and celebrity clientele, Topman carries the best of current season clothing and accessories. Topman attracts fashion-conscious shoppers with its stylish and atmospheric stores. Topman is part of the Arcadia group which includes retail stores such as Topshop and Burtons. Stores are located in Dublin, Cork and Galway. How it Works: Use this gift voucher on AllGifts.ie to order gift cards for use in-store only in any Topman & Burton stores in the Republic of Ireland. Or you can swap for any other gift or voucher listed on the AllGifts.ie website. 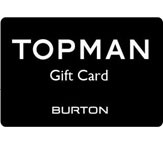 Topman gift cards are posted out free of charge once ordered. 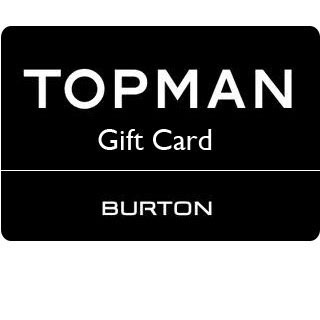 Topman gift cards are available in denominations of €10 and €20 (e.g. €10, €20, €30, €50 etc). Minimum gift card value is €10. Topman was created in the UK towards the end of the 1970s to providing a new approach to menswear. Topman offers fashionable men's clothing, covering men's formal suits to more informal and casual-styling ranges, along with footwear and fashion accessories. There is no limit on how many cards you can use on more purchase with this Store. Topman Gift Cards are posted out free of charge, normally within 5 working days.